How’s Processing of ODIS Online Programming Service? Vas 5054a with ODIS software for online programming is much more hard to offer than before. Eobdtool.com offer ODIS online programming for customer. 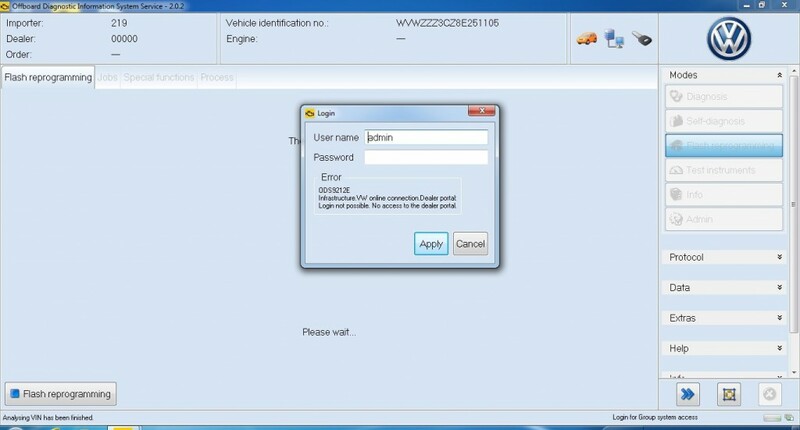 ODIS online programming service for Audi Vw Skoda. Below we share the processing of ODIS online programming service via remote. Online programming service will be done via remote forward, need share customer’s hardware connect to the car via teamviewer, working with our software and online account by our side, then finished online programming for cars. If you need online programming service, pls make sure you have vas 5054a with ODIS 3.0.0 version or above by yourside, and connect it to the cars. Online programming request a high speed and stable network for online programming, better to connect laptop to 4G LTE Mobile Hotspot. Then submit the car information to our sales, order and finished payment for this service. Waiting for online programming processing, online programming may need take 30 mins -3 hours, depend on your nerwork performance. Eobdtool.com also offer online programming service for differenct car, which including Audi, Vw, Skoda, Porsche, Jaguar, GM etc. More detail just contact our sales.